east side bride: who's got $7K? 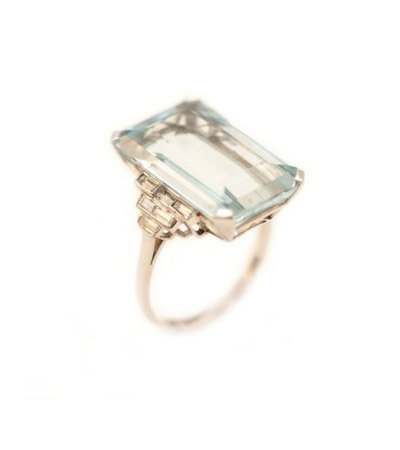 This art deco aquamarine + diamond ring is gorg. This is my birthstone and I've been on the hunt for an Art Deco one for a while. I actually had my engagement ring made and it took us months to get the colour that I wanted. If you are wanting a darker coloured stone try finding stones from Africa they seem to have the darker stones with the blue/green colour that I love. I love my ring and it means even more because he and I designed it together. I dealt with a gemologist (excuse the spelling please) and a jewelery designer to get exactly the ring that we wanted. That may be an option for you unless you really want an estate piece from that Era. Thanks for the blog post from Vintage Seekers! Where was this ring from? I desperately want it!